The first point to make is that Committees and/or course owners should make every effort to ensure that competition rounds take place with minimum interruption from greenkeepers and course maintenance staff. It is especially important that Committees make advance plans around their major competitions, so that the course is presented in optimum condition and that no competitors are unnecessarily disadvantaged by ongoing work during their rounds. 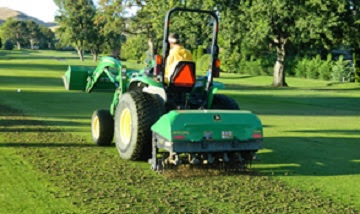 However, there is nothing in the Rules of Golf that makes any allowance for maintenance work being carried out on the course during any competition, even if this means that players will be playing the course under different conditions. This can be compared with morning competitors playing on a dry, windless course and afternoon competitors playing in the same competition in wet and windy conditions, perhaps faced with casual water interference on areas of some putting greens. An obvious exception to the above is if the Committee, or its authorised representative, considers that after a competition commences, course conditions change to the point that they consider that it is no longer in a playable condition, or that circumstances have arisen that render the proper playing of the game impossible. In such circumstances, the Committee may in both match play and stroke play, order a temporary suspension of play or, in stroke play, declare the competition null and void, cancelling all scores for the round in question, Rule 33-2. When a round is cancelled, all penalties incurred in that round are cancelled. Another instance of when a stroke play round should be declared null and void is if one or more holes were relocated and/or tee-markers moved after some competitors had played the hole. However, when it is impossible for a hole damaged during a round to be repaired, so that it conforms to the Definition, the Committee may, in exceptional circumstances, make a new hole in a nearby similar position, Exception to Rule 33-2b. Also, in exceptional circumstances, where there is casual water covering a teeing ground and it is impossible to satisfactorily remove it, a Committee may relocate it, providing this can be done without giving any competitor an undue advantage, or disadvantage, Decision 25-1b/4. Where a single round is to be played on more than one day, the Committee may provide, in the conditions of a competition (Rule 33-1), that the holes and teeing grounds may be differently situated on each day of the competition, provided that, on any one day, all competitors play with each hole and each teeing ground in the same position. Finally, many of us have experienced a situation where our ball in motion was deflected off a maintenance vehicle, or other course equipment, whether stationary or moving. The ruling is the same as when a ball is deflected by any other outside agency, it is a ‘rub of the green’ and the ball has to be played as it lies. If it is deflected out of bounds the player must play proceed under penalty of stroke and distance. Those of you that were early subscribers to my free ‘Rhodes Rules School’ email series (click here if you have not yet subscribed and would like to) will know that the 4th series is titled ‘Pros Getting it Wrong’. I have now completed all 99 issues of this series and have combined them into a full set that can be purchased as an eDocument (.pdf format for easy reference and printing, or transferring onto a smart device). In my experience, reading about how golfers have fallen foul of the Rules of Golf, or have used them to their advantage, is an excellent way to obtain a better understanding and remember them. This is especially true when the names of those involved are familiar to us. However, you do not have to be an aspiring Rules of Golf expert to enjoy reading this series of short articles that average about 700 words. Some of the incidents may be familiar, such as Tiger’s 2.000lb loose impediment, Simon Dyson tapping down a spike mark and Carlota Ciganda’s drop at a wrong place during a Solheim Cup match; others will be totally new to you. Where the relevant Rule has changed since the incident I have fully explained what the ruling would now be. Click here for more information and for the PayPal ‘Buy Now’ buttons. And another - ground under repair marked as such during the stipulated round(s). Decision 33-2a/2 shows that a Committee may be justified in declaring an area as ground under repair during a competition, but obviously this should only be in exceptional circumstances, e.g. substantial deterioration of the area after the start of the competition. Players may not assume that an area is ground under repair and take relief without the authority of the Committee. Seems to me that your response goes beyond what is stated in 33-2a/2 or 34-2/1. There is no mention in those Decisions of "exceptional circumstances" or "after the start of the competition." It's regular practice at most tours that referees mark areas as GUR if a player has requested a ruling for an area (unqualified) and was provided relief as GUR. You say, "It's regular practice at most tours that referees mark areas as GUR if a player has requested a ruling for an area...". I wonder if this is another example of high-profile professional golfers wanting to always play from pristine lies. In my experience of amateur competitions (99% of all compettitions? ), areas are rarely designated as GUR after other players have played through, unless there are exceptional circumstances. Part of 33-2a/2 states, it is preferable that all areas which warrant marking as ground under repair should be so marked before the start of a competition. By implication, no area should be marked GUR after the start of the competition unless circumstances have changed, i.e. they are exceptional. The Decision says that it's "preferred", and I agree with that. However, it doesn't say that areas that may have been missed should not be marked after the competition starts. The Rules and Committee leave that authority to the referees. Nearly all referees head out for their day with a can of white paint so that they can mark areas where relief was provided. I do not accept your comment that, "nearly all referees head out for their day with a can of white paint". I have never witnessed a referee marking an area of GUR during a competition, nor have I seen it occur on any televised tour event. In my opinion, it is a dangerous practice, which could affect the rights of other players who have already played through the area in question and should only be applied in those 'exceptional' cases, where some course conditions may be materially altered during the course of the competition. GUR should be carefully marked before the competition starts and should not be done on the fly by over-zealous officials carrying cans of white paint during play. A reminder that exactly the same Rules of Golf apply to all golf competitions, the vast majority of which do not have access to referees during the course of play.